Midway between sculpture and architecture, Jocelyne Alloucherie’s artwork is composed of two Corten steel structures with three faces. Each piece presents an opening that acts as a metaphoric frame in the space. Porte de jour allows the historical past of the site to resurface. Through its form as a rampart, the artwork testifies to the presence, in the eighteenth century, of the Porte de Québec, which defined the border between the old part of the city and its periphery. 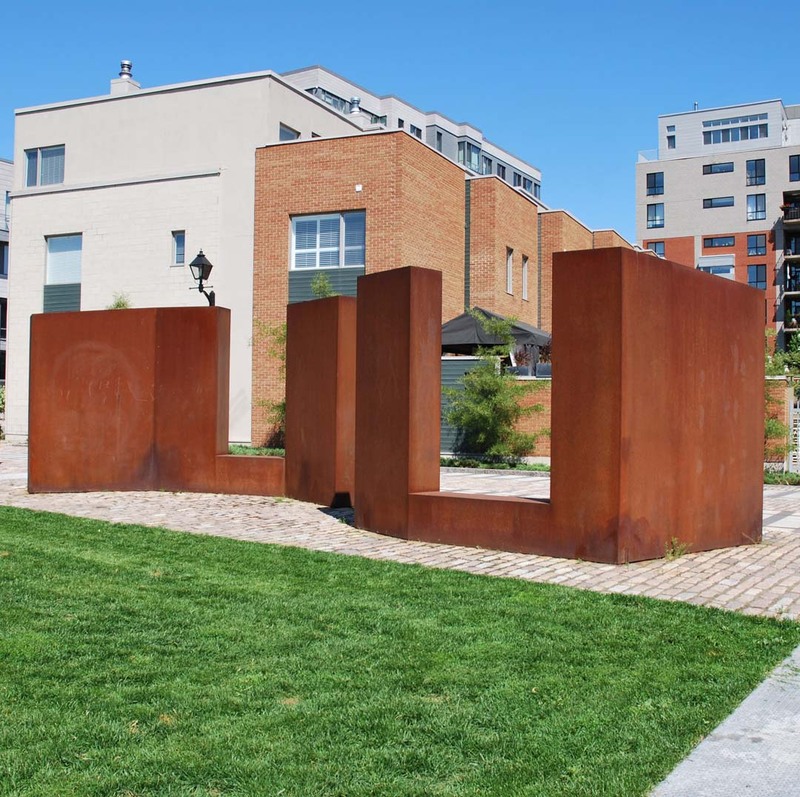 With its reddish colour reminiscent of rusting metal, the artwork evokes the former functions of the site, from the square adjacent to the Dalhousie train station in the nineteenth century to the shunting yard in the early twentieth century. Like a trace of absences, it reconstructs the memory of the place. 1:Jocelyne Alloucherie, project submission, 2004 (our translation). 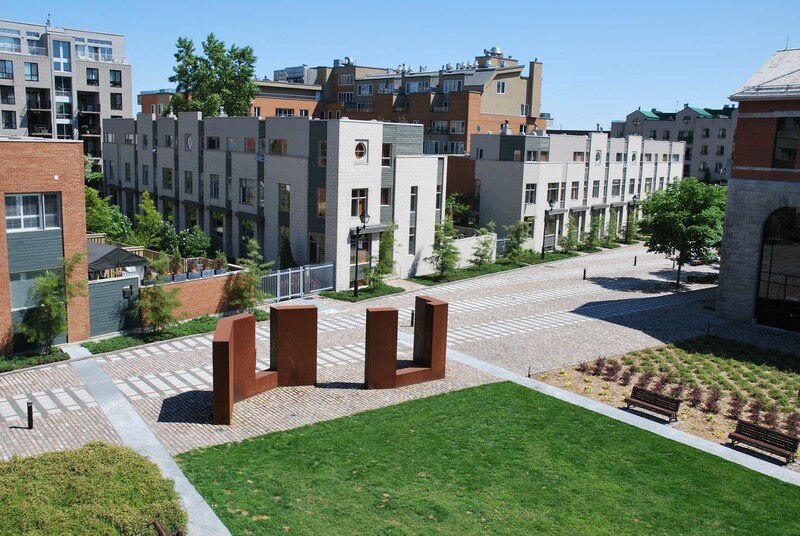 Porte de jour was created in the context of the development of a square adjacent to the former Dalhousie train station edging Faubourg Québec. 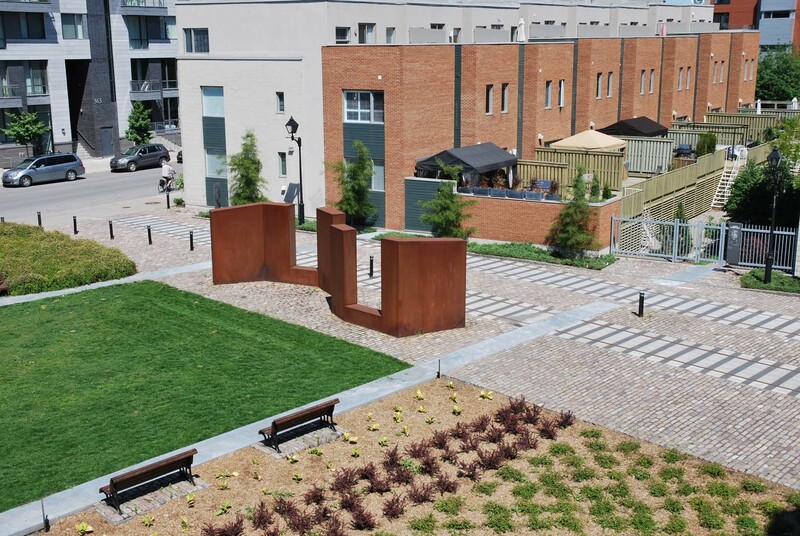 Both Alloucherie’s artwork and this space were created in order to highlight the main aspects of the site’s historical value: situated on the edge of the old fortified city, it was the point of departure for the first railway project heading to western Canada in 1886. With degrees in arts from Université Laval and Concordia University, Jocelyne Alloucherie provokes a perceptible experience of the ephemeral and the immutable through drawing, photography, sculpture, and painting. Her work is included in major public collections in Canada and abroad. Some of her artworks are also found in the public space, notably at York University in Toronto and Collège Gérald-Godin in Montréal.